Health Aid Vitamins are formulated to be readily absorbed by the body for maximum effect. 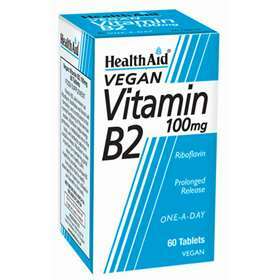 Health Aid Vitamin B2, also known as Riboflavin, aids the break down and conversion of carbohydrates, fat and protein into energy. Vitamin B2 also supports muscle function and excellent at maintaining healthy vision, skin, hair and nails. Aids the production of blood cells to carry oxygen around the body. Enhances the immune system's ability to fight infection. Bulking Agent (calcium phosphate), Riboflavin (vitamin B2), Anti-caking Agent (veg. stearic acid, veg. magnesium stearate), Glazing Agent (PVP).